This is a story about growing up in and near Red Cloud, Nebraska and I thought it would be of great interest to those of us who are descendants of David Clark Smelser who took his family to Red Cloud, Nebraska c1875. I have left the spelling and most of the punctuation as it was. I was born February 22, 1877 in a part dugout and part sod house on Indian Creek 12 miles NW of Red Cloud, Webster Co, Nebraska. I was the eldest of six children born to Ai and Ellen (Smelser) Scribner who were Webster Co. pioneers of Iowa. When about four years old, I saw my first Indian who came begging for food. When I was seven, my father built a frame house which stands. I started school at six years. The late John W. Burrows who was my first teacher, boarded with my parents and used to shoot cotton tail rabbits by moonlight. The school children would pull dry grass and build houses my first school year. When I was past seven my father decided to come to NW Nebraska and take government land. He filed a Homestead Tree Claim and Preemption. J.W. 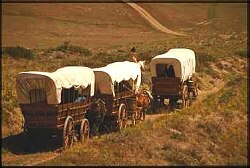 Burrows and Uncle Dan Metcalf drove thru with us each a covered wagon. Our family slept in a tent and how we loved to hear rain on the canvas. We left Webster Co. on Decoration Day and arrived 12 miles of what is now Hay Springs on July 4th 1884. After my father decided on the land he wanted, he and Mr. Burrows drove to Valentine to file on their claims. No railroad or not town nearer than Valentine. They put up our tent where we lived until fall. We god some of our food from Jules Sandoz who had a supply of canned goods in a tent near where the Catholic Church now stands near the Niobrara River. I still can smell the chokecherry blossoms we found along the river. During one of fathers trips to Valentine, mother and we children walked south to the top of the hill and got scared when we saw a man with a red hankerchief tied on his hand carrying a gun. We thought it was an Indian but proved to be none other than the pioneer Jules Sandoz. In the fall of 1884, we returned to Webster Co. and lived south of Red Cloud 2 miles from the Kansas State line for 2 years. I remember we used to pick sensitive roses, so called because the leaves closed when touched. They were very fragrant. My oldest brother and I walked a mile to school, we children would gather sheep sorrel and eat the leaves and flowers. It was rather sour, we ate green grapes and hack berries, caught polliwogs to play with. My play dishes were pieces of broken dishes, mud pies and cakes decorated with red sumac berries. My Christmas present in 1884 was some paper dolls. My brother got a home made cloth mouse. Mother baked a small loaf cake, frosted it and put big raisins on top. Made a pasteboard basket trimmed in blue tissue paper from cotton batting and had me take it a half mile to put on a neighbor's Christmas tree. We all went and had popcorn balls. Finished the evening with an oyster supper. Those were the happy days. The spring of 1886, we returned to Sheridan Co. Hay Springs had sprung up and also a railroad. Father built a little sod house. The roof was willows from the river and sod. My uncle, George Smelser came with us and he and father started digging a well with a spade. Made a windlass and pulled the dirt up with a rope and bucket. On returning to Sheridan Co., father brought 50 head of cattle and hired two young men to drive them, sometimes hauling calves in the wagon, and many times our cattle were badly in need of water before we found a lake or stream. As we came thru Gibbon, Nebraska, a train pulled in and scared the cattle and also our teams. We now had a covered wagon and and covered spring wagon. One night while we were coming thru the sand hills, my cousin Frank Smelser (he helped with the cattle) got out of the wagon where he slept and when father got up in the morning, Frank was gone. No track of him and he was barefooted. No one knew which way he had gone but a few hours later, hearing the cattle he found camp, a tired and scared boy. He never walked in his sleep anymore. We were all happy again even if he had poured out the milk we had saved for breakfast and put a bunch of dried catnip in the pan. The next thing to happen was when we were crossing the Niobrara River at Riggs Ranch. The teams and wagon crossed and the boys were getting the cattle across, my brother Omar went across on a horse. I was walking. I called to father if I should wade and he said to follow some calves but did not know the calves swam part way, so I followed and stepped into deep water which was swift enough to carry me down stream to where the water was shallow enough for me to walk out. I was soaked. Only the top of my sunbonnet did not get wet, but I have never cared to go in swimming since. We arrived at our soddy all right. Father built a one room frame house laid up sod around to all the eaves. We lived in this until about 1889. Then he built a good 2 room sod house. The winter of 1887-1888, Omar and I drove a little team of mules hitched to a spring wagon a little over a mile part way to school and then turned them around and sent them back home. We had to tie the lines together and hand them over the dashboard. The school was in a part dugout and part sod house with only 3 small windows. I was ten years old that winter. Our teacher was J. G. Gaskill, a farmer, but a good teacher. He did not have very good order in school but we knew we had to get our lessons. That spring was the terrible 1888 blizzard. The snow was drifted as high as our only door and father would stand on a chair and push it down from the top as our house would get too warm. I remember it started to snow and blow about the middle of the afternoon on Saturday. Father had gone to town with a neighbor. Mother and I went and fed the cattle by pulling hay out of a stack and tying it up in a sheet and carrying to the cattle. Father followed the pasture fence and got home allright. Our horses in the barn were not fed or watered until the fourth day. Father tried to get to the barn on the second day but could not. Guess we had plenty to eat as we survived thru that terrible "88 blizzard". During our first years here we burned cowchips. They made lots of ashes and did not have a very pleasant odor but answered the purpose. Mother and father, Omar and I would go out and pick them up and throw them in the wagon and haul them home. We had a woodhouse to keep them in to keep them dry. We sometimes went to the river and got wood too. This would carry us thru the winter as it would take two days to go to Pine Ridge for a load of wood and back. There were times when the weather was good and the roads were good that father and John Burrows would each take a team of horses and a wagon and go to Pine Ridge for a load of wood. They would take their tent with them to sleep in and would cook their supper and breakfast over an open campfire. They would have to cut their wood up when they got home, just as they needed it. This was government wood so there was no charge for it. They would just pick it up. Father and Omar and one or two of the neighbors would start early in the morning in the fall for Pine Ridge, be gone two days, take their grub box and some bedding, cut pine trees, saw and trim them, load the logs past the running gears of the wagons and get home perhaps nine or ten o'clock at night. The heavy loaded wagons could be heard a long distance on a still night. Oft times they made two trips a week, saw them in stove lengths by hand, split the blocks into stove size pieces and let them dry for winter. Hardly anyone burned more than one stove as the soddies were warm warm houses. When I was thirteen to sixteen years old we went to the neighborhood dances. Every family took something to eat, usually charging twenty-five cents for a dance ticket. We would take pie, cake or sandwiches. the dances were held in the peoples homes in their living room. At one dance, John Burrows asked me to dance and I told him I was engaged, meaning that I had that dance. He said I was pretty young to be engaged. I often played second to the violin on the organ and have called for a few square dance but would rather dance. A neighbor lady taught me to play the organ and I picked the square dance calling up from just by hearing it called. Music was furnished by the neighbors who could play. When I was about fourteen years old, I attended singing school taught by our neighbor J. G. Gaskill, a twin to J. B. Gaskill. I learned to read notes. We had literary in an old house used for our school house. I was Secretary. Later we had literary and debates in what was known as the Scribner schoolhouse, a frame building built on the corner or father's preemptoin. J. G. Gaskill also taught Parlimentary rules one evening a week during the school term. At literary, we would always have programs, different ones would speak pieces, sing songs and put on skits. It was most usually on Friday nights, a real night of entertainment. One of the ladies that I remember was Pearl Wintermute, Willis's mother who played the organ. I also took organ lessons from her. Rev. Wise, a Methodist minister, preached and had Sunday School and Revival meetings here and at one of his meetings I was converted and later baptized by immersion in what is known as the Walgreen Lake but at that time was called Alkali Lake. The revival meetings were held at the Scribner schoolhouse, with good attendance. I can remember one instant where one young woman was asked to be converted and to accept Christ as her Saviour and she said she had plenty or time and just one week from that day, she was buried. She passed away when her baby was born. It was a spring day, after church before dinner that I was immersed in the Walgreen Lake. There was one other girl besides me who was immersed that day. She was Sadie Myers, Zesta Cunningham's sister. Omar, Ira and I walked two and a half miles to the Albert Heesacker School on the south when I was fourteen. The two miles north to the Passmore school where the Banner School now stands. I was twelve at this time, the school terms were from two months to six months long in sod school houses. This was because the older children would have to help on the farm. In the fall, we would have to pick corn and potatoes and in the spring we had to help with the spring planting. Later, I taught school in both districts. I went to what was called Normal and Institute in Rushville five weeks during June and July when I was about fourteen and a half years old. Rose and Emma Marcy, Clara Parsons, Mary Walgreen, Sadie Myers and I would rent a house in Rushville and do our own cooking. I got a second grade certificate and taught the fall term of school in our own district, which was Scribner school. I had about a dozen pupils and each had to furnish their own school books, ink pens, tablets and slates. For evening entertainment were spelling school, neighborhood dances where everyone took food and had midnight lunch and once a week, singing school. A neighbor boy walked home with me, about a mile, but I sent him home before we were near my home as I was not to have boyfriends until I was sixteen years old and I then was fifteen. The winter I was sixteen, we had a revival meeting in our schoolhouse. I went to school that winter and Walter Marcy was our teacher. I taught a two months term in a log school house in the Mendenhall School going back and forth on horseback. One term in the Joe Marcy School and fall after I was sixteen a two month term south of the river, a sod house, no plaster and no floor to begin with but later the school was moved to a plastered old sod house ( the late Dave Phillips house) a fairly decent place and not as many rattlesnakes. I had to board out and got awful homesick and I was sixteen miles from home which seemed a long way to ride on horseback. I had to sleep with an old lady with a crooked back and she would put liniment on her back every night and odor was awful. I thought I could not sleep with her but I had to. The wages for teaching was $20 a month and pay board out of that. And out of this, I bought an organ and took some music lessons. I boarded at home my first term. Our Fourth of July dresses was calico with ruffles but were appreciated as much as silk and nylon is now. One Fourth of July, we celebrated at a little sod schoolhouse with poles set up in front and green willows overhead for a shade. Races were mostly the program. Lemonade made in a big earthen jar and dipped out in glasses. Also homemade ice cream but we all enjoyed it. Ice cream and pie socials were frequent gatherings for church benefits. I was Sunday School Secretary for a long time. Times were hard but we knew nothing else and enjoyed ourselves very much. Sometimes a wagon load of we young people would drive to Hay Springs to church, a distance of twelve miles. Usually some of the parents went too. It might be below zero but we all set in the bottom of the wagon, listened to the wheels screeching on the frozen snow and we keep time singing our favorite songs such as "When The Roll Is Called Up Yonder", "The Light Of The World Is Jesus", God Be With You Till We Meet Again" and many others. I was sixteen this winter and had my first date. Went to Sunday night church at what was then called the Glenn School with a young preacher about eight years my senior, Jesse Parsons. His parents were English people, very devout Christians. I don't know why but we did not keep company very long. One incident that happened during this time was a neighbor boy near my age came to take me to Literary and before we got away, Jesse Parsons came also. He asked me who I was going with. I did not give him any definite answer so he walked to the schoolhouse about one half mile with my mother carrying my baby brother. When I was eighteen years old, my father bought land six miles NW of Dunlap and built another sod house. Later, I was married in this house to Charles Waldron in 1896. There was free range for cattle and horses at this time so our cattle had plenty to eat and a small stream of water to get plenty to drink. This was one of the reasons that he moved to Dunlap was because of the free range. I have ridden horseback considerable and drove oxen, horses and autos in my time. I met my husband, Charles Leonard Waldron, at a dance when I was Eighteen past. He was a bachelor farmer but had been a stage coach driver. He rode between Deadwood and Nonparell. He was good looking and wore a mustache. We were married July 29, 1896 in my father's sod house. I wore a white brocaded silk dress that I had made by a girl. The dress cost $5.00 when made. My brother Omar and a girl named Annie Smith stood up for us. There were approximately twenty guests. The minister was Rev. A. A. Garner. He was a community minister. The wedding was in the afternoon and then mother had a wedding supper for us about 6:00 P.M. Mother made us a wedding cake. One incident I clearly remember which was quite a joke on me was that I bought some high top black lace shoes at Chadron and when I went to put them on, they were both for the same foot but I wore them anyhow (and I had to keep right on wearing them until I got them wore out). After the wedding supper there was a wedding dance held at my folks. I received many gifts. After I was married, I lived in a sod house five miles NE of Old Dunlap where there was a cheese factory, post office, store and black smith shop. This sod house consisted of two rooms, the kitchen was sod but the other was frame. Later we moved on Harry Bartlett's place. We had many nice neighbors and Literary at the schoolhouse a half a mile away. Our first baby (Nora Bell) was born here. In the fall of 1898, we left Dunlap and worked for Col. C. F. Coffee on his home ranch on Hat Creek. A month later Col. Coffee had his hired men bring 500 white faced cows and calves to be weaned, to the home ranch from his Rawhide Ranch in Wyoming. It was a constant bawling from the cows and calves both day and night for a few days. Now one dared go outside the yard fence as these cows were sure on the prod. We left there in March and returned to Hay Springs as I could not manage the work with two babies. Our wages on the Coffee Ranch was $30.00 a month. While working at the Coffee Ranch we lived in a big two story house with the Coffees. I had to do the cooking and the house work and if there was hired help, I would have to cook for them. In the spring of 1899 we moved to father's farm south of Hay Springs as father had moved to the sandhills living on L. J. Steihl's ranch taking his cattle and horses where there was plenty of range. We farmed and milked cows, set the milk in a tank inside a house close to the windmill as water ran thru the milk tank to the big tank outside. After the cream had risen on the milk, I skimmed it off and churned it in a churn that stood on three legs turning a crank at one end and paddles inside washed and worked the butter to remove the buttermilk. I packed the butter in two gallon jars to go to market and get eight cents a pound for it. we could buy coffee for 12 1/2cents a pound, sugar - 20 lb. for $1.00, flour .98 cents to $1.00 for a 50 lb. sack. Calico print for 9 cents a yard. I don't think it was any worse than now in the 1950's. We returned to Hay Springs in March 1899 and rented my father's farm 12 miles SE of Hay Springs where we farmed for two years. In the summer of 1899, we raised a fine garden, watermelons galore. Harriet Sandoz, one of old Jules Sandoz' wives came quite often selling chokecherries she had picked on the Niobrara River. She drove a pony to a cart and she surely thought lots of her horse. Sometimes she stayed overnight and helped me and also helped Mrs. John Burrows Sr. quite a lot. She was a "good old soul". Mrs. Burrows was my best neighbor, raising a large family and getting along with very few conveniences as we all did and I think we were happier and more neighborly than the people of the 1950's. Mrs. Burrows was from Switzerland and was a very educated woman. She taught school in Canada and also in the East and could talk several foreign languages. She was a sister of Jules Sandoz. Our third girl Nellie May was born when we were on the L. J. Steihl's ranch. In the spring of 1902, we bought the land from the government and had to build a sod house. It was built on a hill just above a canyon. In July 1903 my husband and Mr. Lister, a hardware man from Hay Springs, was setting up a new binder we had just bought. On Thursday afternoon the worst flood of rain and hail came. It was the worst flood in the history of this country. I flooded the inside of our house, our organ and pictures were ruined with water and mud. Babe was the baby and my husband carried her to the barn and got Nora and Wilma to the barn. I followed, we stayed there until the rain stopped. Our neighbors Mr. and Mrs. Frank Pliska who lived a mile south took us in until we could get settled. We moved the house south on top of a hill where it now stands. It made waste of livestock, crops, and trees. Our hogs were found, they had drifted in the water 4 miles west of us. The chickens managed to get in the top of trees. It swept down logs and everything in it's path. The railroad and culverts clogged and water backed up. The flood in the lower part of the town of Hay Springs was three feet deep. There was a cloud burst on Bordeaux Creek, five railroad bridges were destroyed. It was fortunate the storm did not come a week earlier when some 3000 persons were camped on the grounds. After we got moved upon the hill south, we had to carry water from the canyon to the top, it was pumped by wire-arms back and forth by the wind. The windmill was on the top of the hill. Babe was always at our neighbors, Mr. and Mrs. Pliska whenever she could. Mr. Pliska would toss her up and call her his "Babiska" The Pliska's were Bohemian. Five more children were born here. Cora, Cleta, Harvey Leonard, Omar Ai, Lyle Albert, Helen Ann. During the years 1908-1909 we had pine trees cut down and sawed into lumber. This lumber was built into a large barn in 1910. The barn was 50' x 60' with a large hay mow and still stands. We also had a large potato cellar usually selling the potatoes in the spring. This cellar was later a chicken house as it faced the south and was on a level in a sidehill. We pumped water with a pumpjack run by electricity when the wind did not blow. We had about 100 head of cattle and horses and a lot of hogs so it took lots of water. We always had a big garden and truck patch but did not irrigate. Nice fat heifers sold for $20.00 a piece. When Omar was a little boy he had a language all his own. Our neighbor lady he called "Mrs. Goga", this was Mrs. Pliska. She had ducks and they were "goga", meat was "oosh", eggs was "iia", Nora was "Chee", Wilma was "Num Num", Babe was "Diash" and Harvey was "Ish". Lyle's nickname was Buddy, when he was little he had long blonde curls and when he started to school I had to cut them and he cried and said "No, my curls will bleed". My husband died in Feb 1932. Lyle and Helen graduated from the Hay Springs High School in May 1933. Oleta kept house for them in town but they came home on weekends. We had good crops in 33 especially the corn was real good and well matured. The boys put up hay for the stock and we sold quite a lot of hogs for less than 4 cents a pound. In 1934 we rented the farm and Harvey and Lyle went to Idaho and Oregon, worked thru the summer and came home in the fall. In 1935 I kept my grand-daughter in town to go to school. I worked out quite a lot when possible to make ends meet. Helen kept house while I was away. All the other girls were married by this time and had homes of their own. My youngest sister passed away in Dec 1909, my father in 1926, my eldest sister in 1925, my oldest brother in 1958, my youngest brother in 1958 and my mother in 1948. So now in 1958, only Ira and I are left of the Scribner family. No grandsons to carry on the name.